The 122-year old company was founded in France as an aeronautic company building hot air balloons and balloon airships for the military. 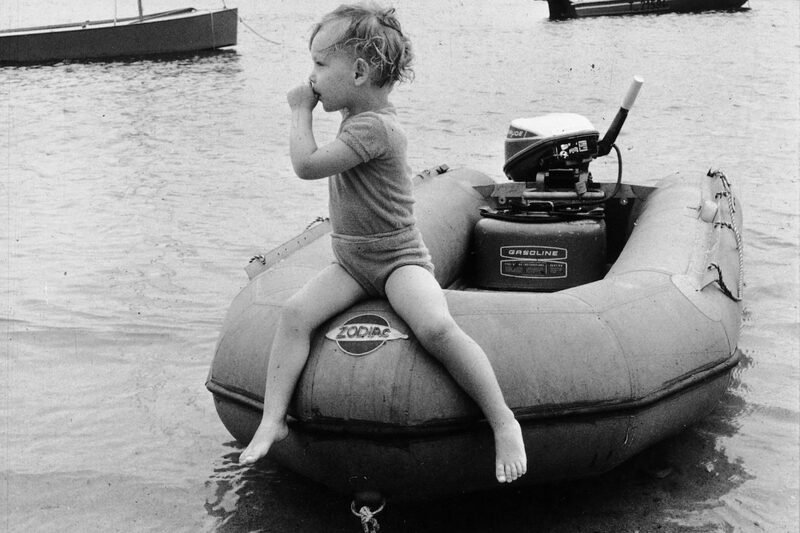 From there, the company’s engineers invented the inflatable boat in the 1930s, which was made popular with Cousteau’s movies. The Zodiac name is so well recognized among the general public that a majority of people now associate inflatable boats with the Zodiac brand. Today Zodiac Nautic is the world leader in inflatable and rigid-hulled inflatable boats. To maintain its leading position in the boat industry when potential owners are exposed to unprecedented choice, Zodiac decided to give their customers the ability to customize their products. For the most part, the boating industry is still stuck in the past: producing standard boat models with limited customization options. Zodiac decided to reverse that strategy: let the customers tell them what they want in terms of equipment and trim and then produce boats to those choices. Zodiac also wanted to provide the possibility to virtually “visit” the boat once customized. 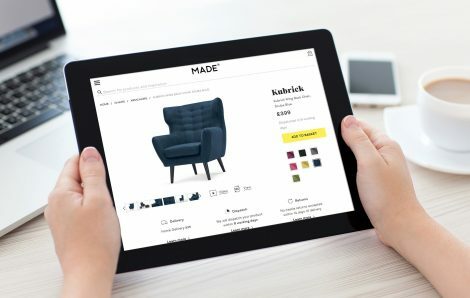 Zodiac created a 3D configurator allowing them to directly connect with their customers to better adapt to their interests. Creating a configurator for Zodiac was definitely challenging. As boats are used in very different ways (fishing, diving, etc.) each model has many customizable elements (for instance: ski pole, sunroof, shower kit, console, bolster, roll bar) that needed to be included. Zodiac also wanted to add an automatic pricing display the ability to share the configured boat on social media and to download it in a PDF. All of this in 5 languages and 3 currencies! The Zodiac Configurator began with their high-end model, the N-Zo, which mostly comes with customized color (blue, red, white, etc.) and equipment options (sunroof, ski pole, sound equipment, hull, deck, inflatable tubes, upholstery, rubstrake). 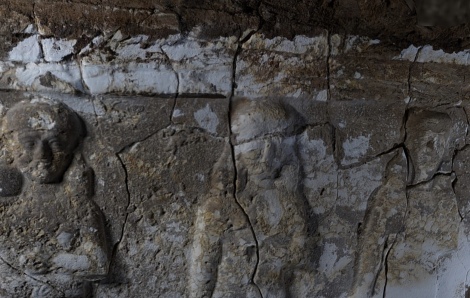 Two separate projects had to be addressed: the website and the 3D models. 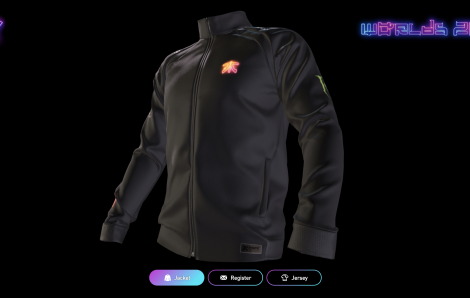 The project was taken on by Klaas Nienhuis, an independent developer for 3ds Max who worked on projects such as product configurators, 3D mapping tools, and 3D pipelines. He didn’t need to create the 3D models as Zodiac already had their own 3D models. Instead, he worked on optimizing these models. I think the era of beautiful online 3D configurators has started, and the Sketchfab team has a lot to do with it. Antoine, Chief Digital Officer at Zodiac. 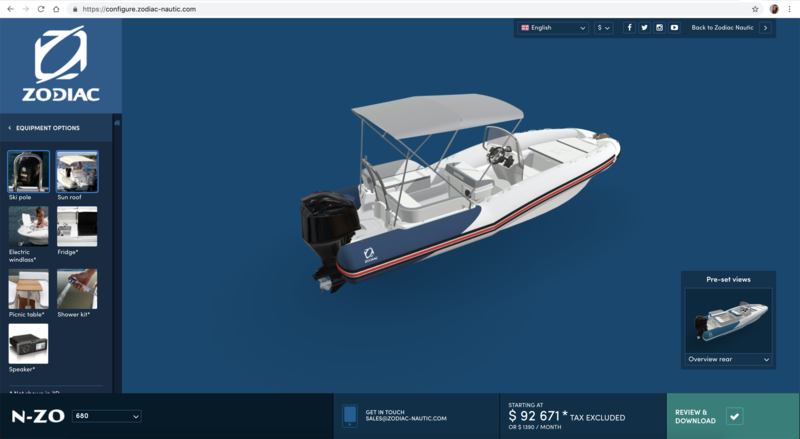 While almost all their competitors use 2D, Zodiac gives shoppers the unique ability to customize their dream boat in real time thanks to a Sketchfab 3D product configurator. Shoppers can personalize almost every element to create a truly unique boat: hull, deck, inflatable tubes, upholstery, rubstrake… The possibilities are almost endless! Interactive by nature, the 3D configurator takes visitors on an immersive online adventure and a virtual visit of the configured boat. Shoppers can interact with their dream boat, zoom in, zoom out, rotate, explore it in more detail and see the price of the boat as they configure it. This is as close as to an in store experience as you can get! Once they’re happy with their model they can share it on social media and download a PDF of their boat. This PDF contains a screenshot of the configured model and a list of all the options they’ve chosen. It’s a thoroughly modern approach to a well-worn industry and significantly increases customer engagement, when compared to static images. If they leave their contact info, a Zodiac dealer will get in touch. Since the dealer also receives a copy of this PDF configuration, they know exactly what the customer is after, thereby facilitating the sales process. 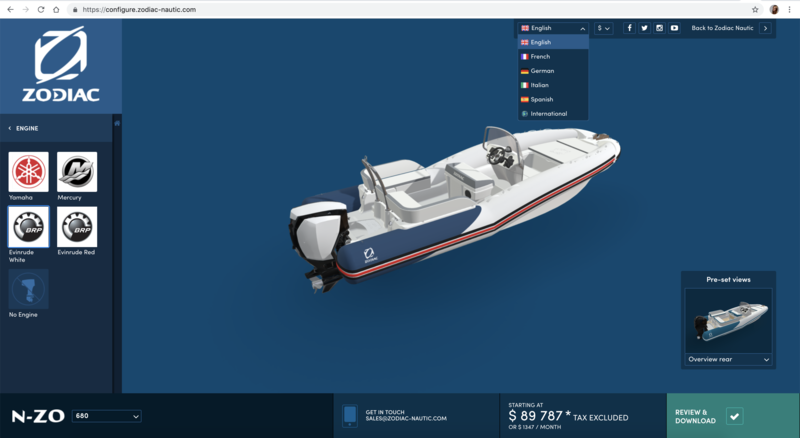 Thanks to the Sketchfab 3D product Configurator: Zodiac is now able to produce customized boats with the attributes and colors specified by the customer. Zodiac no longer tries to anticipate changes in trends years in advance with no guarantee that their new styles will be popular by the time the boat reaches the dealers. This new strategy allows Zodiac to reduce their stock and to avoid producing unsold products. The configurator has proved to be quickly and easily adopted by Zodiac’s customers; today more than 50% of Zodiac’s sales of the N-Zo are made from customized boats. The configurator has increased sales of the N-Zo model by 50% in 2 years and it is their most expensive boat! The tool is available on desktop, tablets and smartphones, allowing dealers to advise buyers in a whole new way in showrooms, tradeshows, and on the go. 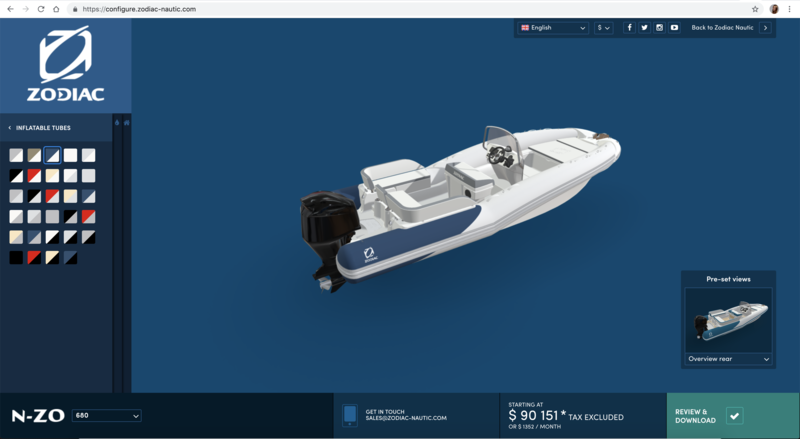 The “fun” part of the configurator and the possibility to see your models in Virtual Reality allows dealers to generate foot traffic at their booths during boat shows and events worldwide. They’ve been waiting for this a long time and dealers even ask to have the configurator on more models! Today, Zodiac uses the configurator primarily for two products: the N-Zo (4 models) and PRO (2 models). With the success of the initial launch, Zodiac is planning to add many new options in the configurator to include more than 30 different boats. Don’t forget to visit Zodiac Nautic’s excellent boat configurator and try out all the different options! Are you inspired to build an application with our viewer too? Contact us to talk to a 3D expert!